Overall, I would rank classroom management and discipline low on my list of things that frustrate me about teaching. Looping allows me to get to know my students fairly well and that strong relationship often prevents minor incidents from escalating. I also know all of my students' families and am quick to point out our joint expectations. 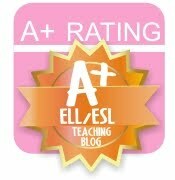 However, just because I write a blog, do not believe that my students are perfect. Like many middle school students, they do sometimes say or do something inappropriate. Avoid the Temptation to Overreact: When faced with a disrespectful student the urge to show him who is in charge can be awfully tempting. It may even win you a class full of compliant students for the entire period. However, in some cases, your reaction may cause the situation to escalate until you are forced to call in reinforcements. I find in situations like these, it's best to keep your cool and then invite the student to discuss the situation with you either in the hallway or after class away from a captive audience of his peers. 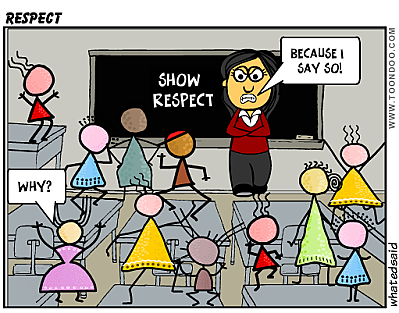 It's Not Personal: Students disrespect adults (and each other for that matter) for an array of reasons. Although it's easy to say, don't take it personally. When implementing consequences, make it about the behavior, not about the student. After the situation has been resolved, move on. In The Rare Case That It Is Personal: While ninety-nine percent of cases involving student disrespect are not personal, on the rare occasion, the student may indeed indicate a dislike for you or a personality conflict. Do not allow yourself to get too emotional over this. After all, we all have most likely dealt with authority figures in the past that we did not see eye to eye with. This has even happened to me a handful of times over my career. I've let these students know that while they do not have to nominate me for Teacher of the Year, they do have to follow the rules just like everybody else. In return, I promise to treat them fairly and with respect. Hold Your Ground During the Parent-Teacher Conference: This may be a shocker, but when I met with this particular student's mother, she informed me that she did not raise a disrespectful daughter. She even expressed doubt that the alleged incidents even took place. I commended the mother for doing an excellent job raising her daughter alone in a new country. However, I also held my ground and explained to her that my schedule does not allow for meeting with parents based on fictitious events. I calmly repeated every word that her daughter told me and expressed my desire to move on so that I could help her daughter reach her maximum potential. The meeting ended with a hug from the mother and an apology from the student.